What is Sustainable Winegrowing and Certification? Check out our new video describing key elements of sustainable winegrowing and Certified California Sustainable Winegrowing (CERTIFIED SUSTAINABLE). Watch this video to hear from Francis Ford Coppola Winery on the value, commitment and benefits of becoming Certified California Sustainable Winegrowing (CERTIFIED SUSTAINABLE). La Crema sees value in measuring water usage and identifying hotspots via a Water Facility Balance. Conduct your own facility water balance by using CSWA's Winery Water Efficiency and Hot Spots Tool. “Cómo llevar a cabo una prueba de campo de uniformidad distribución” - Mira un video para aprender cómo llevar a cabo una prueba de campo de uniformidad distribución y aprendre como usar las hojas de datos para calcular el DU en su viña. Descargue la guía aquí. Descargue una plantilla de las hojas de datos aquí. Watch how a Distribution Uniformity (DU) Test is completed in the field and learn how to use CSWA's field data sheet template to easily calculate your vineyard's DU. Download the written step-by-step guide here. Download the field data sheet template here. “La Importancia de Uniformidad Distribución” – Aprende por que la practica regularmente de pruebas de DU es importante para la calidad de uvas de vino. Learn why conducting regular Distribution Uniformity (DU) tests is an important practice for winegrape quality. Watch this video to learn about vineyard trunk disease. Trunk diseases are the limiting factor of vineyard longevity and one of the main reasons why many vineyards are replanted after only 15 to 20 years. Download the associated handout on Trunk Disease here: Trunk Disease Prevention. View this video webinar to learn the necessary steps to reduce the risk of fire on your property and how to prepare your vineyard or winery staff in the event of a fire. To learn more about using sustainable practices to reduce risk in the vineyard, winery and marketplace, view the full guide: A Winegrowers' Guide to Navigating Risk (Spanish language version: Guía de Viticultores para Navegar el Riesgo). Thank you to the USDA Risk Management Agency for helping to fund this project. A CSWA one hour webinar on preparing your vineyard for winter. Speakers include Rich Casale, Erosion and Sediment Control Specialist and Bill Birmingham, Conservation Project Manager at Napa RCD. For handouts related to the webinar and more information visit the CSWA resource page here. Fuel cells are a reliable, efficient and stable energy source that offer many benefits when compared to traditional combustion energy sources, including energy savings and reduced greenhouse gas emissions. PG&E’s Self Generation Incentive Program (SGIP) provides financial incentives for the installation of new qualifying wind or fuel cell self-generation equipment. Visit PG&E's SGIP site for more information about incentives http://www.pge.com/en/mybusiness/save/selfgen/index.page. Find out more about why pump efficiency is important and how you can save money. Since pumps are such a big part of the vineyard irrigation system, there are big opportunities for energy savings. Learn more about how you could see up to 33% in energy savings through pump efficiency. For additional information about PG&E’s Advanced Pump Efficiency Program, visit: www.pumpefficiency.org. Hear about challenges and opportunities of implementing energy efficiency upgrades at Treasury Wine Estate’s historic Asti Winery and the benefits of respecting the historical integrity of a building during retrofits. Learn more about the how to get free design assistance and save money while planning, building or expanding your energy efficient winery through Pacific Gas & Electric's Savings by Design program and find out more about PG&E rebates and incentive programs at PG&E Agriculture and Food Money-Back Solutions. Learn about the many benefits of on-farm biodiversity at Bonterra Organic Vineyards in Ukiah, CA. Methods of conserving and enhancing biodiversity include habitat conservation and enhancement around or in vineyards, planting and incorporation of cover crops and other vegetation, protection and attraction of wildlife species and the use of compost and soil amendments that increase soil biodiversity. These practices help growers produce grapes while minimizing negative impacts on natural resources and provide natural buffers to the ecosystem, including erosion control, increased soil fertility, and reduced pest and disease pressure, which all help to improve grape quality. Learn how California vintners and winegrape growers have utilized the 3rd edition California Code of Sustainable Winegrowing Workbook to measure their level of sustainability and benchmark internal practices against industry best practices. Using a "Cycle of Continuous Improvement," participants self-assess their operations, interpret their performance, develop actions plans to improve, implement changes and reassess. The workbook addresses ecological, economic and social equity criteria through an integrated set of 15 chapters and 191 criteria, which includes a built-in system with metrics to measure performance. To get started with a self-assessment of a California vineyard or winery visit: California Sustainable Winegrowing Alliance. 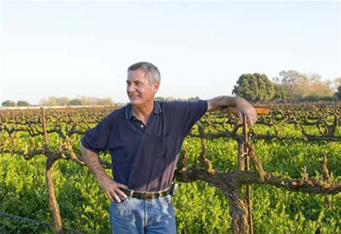 Learn how Boisset Family Estates in St. Helena, CA uses performance metrics to measure and track their resource use over time and make improvements to their farming practices in areas such as water and energy efficiency. Knowing and understanding the relationship between vineyard and winery practices and measured outcomes is important for benchmarking and managing performance to optimize business operations, decrease costs, and conserve natural resources. Get started tracking your water, energy and nitrogen use at Performance Metrics for the California Sustainable Winegrowing Program. Hear how Julie Nord of Nord Vineyard Services in Napa, CA has implemented management practices in the vineyard to reduce greenhouse gas emissions. These management practices have been identified by researchers and experts who have targeted the major sources of greenhouse gases emissions in the vineyard. Learn more about this research in CSWA's handout titled, "DNDC Greenhouse Gas Modeling for California Vineyards." See how Trinchero Family Estates manages their waste responsibly at their St. Helena facility through recycling efforts, waste audits, composting, employee engagement, and choosing suppliers who use recycled materials. See how J. Lohr Vineyards & Wines, a Certified California Sustainable Winegrowing (CCSW) vineyard and winery, manages and conserves water at their Paso Robles winery. They begin by tracking their usage and then engage employees through a volunteer committee to review usage data and make suggestions to improve management practices. For more information about their commitment to sustainability, visit the J. Lohr website. See how Sonoma Wine Company, a Certified California Sustainable Winery, uses Pipeline Inspection Gauges (PIGs) to save money, help conserve water, and reduce energy use. Sonoma Wine Company was able to utilize PG&E’s Tool Lending Library (TLL) to implement their PIG. For more information, please visit: PG&E Tool Lending Library (TLL). See how Williams Selyem Winery, a Sustainable Winegrowing Program (SWP) participant, harnesses and utilizes the sun's energy to heat water for cleaning and sanitizing in their winery practices. Learn how they worked with PG&E to install solar thermal and reduce reliance on expensive propane. For more information, visit the PG&E rebate program site. Learn about irrigation efficiency at Gallo Vineyards, a Certified California Sustainable Vineyard. Discover how various elements of infrastructure contribute to energy and water efficiency in the vineyard, including source meters, regular testing of equipment, and uniformed distribution. For more information, visit: Advanced Pumping Efficiency Program or PG&E rebate program. Learn how Turner Road Vintners, a Constellations Brands winery and a Certified California Sustainable Winery, provides wetlands habitat for the benefit of local wildlife and employee enjoyment, while improving water quality and saving water through the installation of process water ponds and wetlands restoration efforts. Learn how to get free design assistance and save money while planning, building or expanding your energy efficient winery. Learn how Imagery Estate Winery increased the energy efficiency of their refrigeration system, saved money and reduced CO2 emissions through installing variable frequency drives on their glycol pump. Learn how Korbel increased energy efficiency, saved money, reduced CO2 emissions and improved water quality through installing a new aerator system. Refrigeration efficiency measures, pipe insulation and other sustainability strategies at Jordan Vineyard & Winery. Moderator: Chris Savage of E. & J. Gallo Winery, and Panelists: Bill Cooper of Cooper-Garrod Estate Vineyards, Kim Ledbetter Bronson of Vino Farms, Neil Roberts of Roberts Vineyard Management, and Steve Smit of Constellation Wines U.S.